as we let you know on Sep 20, CHSRA will hold the first of three Alignment Analysis Open House sessions in the SF peninsula this evening. The other two will be held on Oct 9 in Sunnyvale and on Oct 13 in San Francisco, respectively. The general process of how Alignment Analysis works is explained in this primer. CHSRA has also published exhibits, a set of slides detailing the alternatives under consideration in the SF-San Jose segment. These will be explained in more detail during the Open House sessions. Slide 1 shows an overview of the segment. In sections with more than one colored line, multiple options are still being considered at this stage. Obviously, only one will be implemented. The slide does not show which - if any - rectifications of tight curves in the corridor are planned, nor the track order, nor the location of UPRR freight spurs. The freight rail operator has - unreasonably, IMHO - asked for full grade separation of the associated turnoffs against the HSR tracks. Slides 2, 3 and 4 describe variations of how Transbay Terminal Center and 4th & King facilities in SF could be utilized for HSR (focus on bottom 1/4 of each slide). For example, slide 4 shows the option of an HSR station either at or below grade at 4th & King only. Slide 5 shows the option of a Beale Street terminal instead of the TTC train box, with a tunnel not under but north of Embarcadero (i.e. under lots of buildings), apparently to avoid an 18 foot box sewer (PDF p42) identified by TJPA (h/t Andy Duncan). The map below shows a staggered variation of my own that would cross under it twice but avoid tunneling under any buildings. Two full-length platform tracks would be intermodal with Embarcadero BART/SF Muni, another three would terminate within 300 feet of it. The thick red line indicates a two-track tunnel under Main Street, the TTC building would reduce to just a regular bus terminal, connected by pedestrian passages either above or below ground. This is just intended to illustrate one of many possible refinements of the Beale Street terminal idea - assuming it will be refined at all. Note that under CEQA, CHSRA is required to study a reasonable range of options, though it could be argued it already did so at the program level. The Beale Street terminal option was included in response to a comment received during the public comments period for the program level EIS/EIR, but the Transbay Terminal was eventually retained as the preferred option. CHSRA evidently considers it close enough to the TTC building to satisfy the AB3034 mandate that the SF station must be at the "Transbay Terminal". It's not immediately clear if a station anywhere other than in the TTC train box would invalidate the Record of Decision that TJPA has already secured or its $400m application for HSR stimulus funds. Perhaps CHSRA ought to seek a compromise rather than invite the wrath of an entire city. Slide 6 shows the option of dedicated HSR tunnels all the way from 4th & King to Bayshore. Since HSR trains will be traveling at modest speeds in this section of the PCJPB corridor, it's worth asking if they shouldn't share tracks with Caltrain in tunnels #1 and #2 in the interest of saving money - even if that means modifying or closing Caltrain's 22nd Street station. UPRR's northernmost turnoff toward the mighty port of SF is at Oakdale Ave, just north of tunnel #3. An agreement to limit freight traffic north of Bayshore to nighttime operations would mean HSR and Caltrain could share all four of the old but serviceable existing tunnels, resulting in additional savings. Sharing just two tracks north of Bayshore would be contingent on regulatory relief and high throughput signaling/timetable integration. It would not be possible further south, where the speed differential between Caltrain locals and HSR express trains is high. Slide 7 does not show UPRR's South San Francisco yard, where consists are assembled/disassembled during the day for transport down to San Jose and Fremont in the evening/at night. Note that FRA-compliant heavy freight trains are limited to gradients of 1% whereas non-compliant HSR trains and Caltrain EMUs can tackle up to 3.5%. That makes a huge difference in the run length required for vertical transitions. 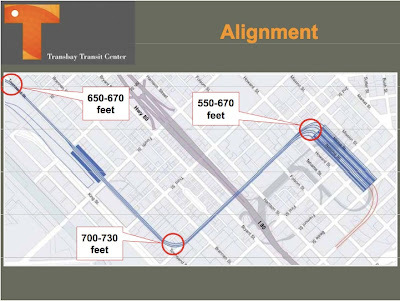 Slide 8 appears to imply four tracks side-by-side through downtown San Mateo, either above or below grade. The PCJPB is currently just 51.5 feet wide between 2nd and 3rd Streets. Widening would require acquisition of adjacent land via voluntary transactions or eminent domain. It's not clear to me if the expensive(!) potential alternative of two elevated plus two tunnel tracks is being considered as well. Including legacy tracks in elevated grade separation works that are will be used for HSR makes a lot of sense, but CHSRA arguably has no mandate to construct completely separate works for Caltrain alone. Slides 9 through 12 show that tunnel options are being considered for Redwood City, Atherton, Menlo Park, Palo Alto, Mountain View and even Sunnyvale. Several underground Caltrain stations are shown, implying tunnel sections with not just two but 3-4 tracks. Christmas must be coming early and very often this year. Note that Mountain View is in the running for the mid-peninsula HSR station. The VTA light rail tracks already there are not shown as a potential conflict. Slides 13 and 15 illustrate the options of extra-high aerials and extra-deep tunnels in Santa Clara and north San Jose, to clear existing road overpasses and the future BART alignment, respectively. Because absolutely everything has to make way for BART, of course. The massively cheaper at-grade option would probably require elevating the Santa Clara and College Park stations, though that option is not articulated. There are already six five tracks under I-880 right now, it's not clear the support columns there would permit a sixth even if the others were moved. Caltrain's CEMOF facility would need to be scaled back to make room for HSR tracks at grade. Fwiw, the right of way maps for mile posts 44 through 47 indicate that 95-100 feet of width are already available in most places. Confusingly, the option for an at-grade HSR station is shown but tracks leading to it are not. Slide 15 indicates the option of a deep underground HSR station at San Jose Diridon is also now under consideration. I stumbled across the videos below on YouTube and thought I'd share them with you. In them, Prof. Peter Newman, a leading rail advocate in Perth (Australia), articulates why and how that city (pop 1.65m, annual growth ~2.5%) has managed to revive its regional rail services in the face of strong opposition from the asphalt lobby and conservative media outlets. The keys to success were strong public demand for speed and capacity, episodes of high gas prices and a few good few men and women in city/regional politics. A boom in the prices of commodities mined in Western Australia has been instrumental in getting the projects funded. Perth is yet more evidence that passenger rail isn't just about transportation. Stations can and do act as anchors for re-inventing entire neighborhoods and city centers to shift the focus back from cars to pedestrians. HSR in California will run at much higher speed, so results will be different. However, I expect some parallels at a larger length scale that includes short-hop flights. In particular, there should be similar synergistic ridership effects with connecting transit and pressure to expand freeway capacity should ease. Will urban planners in car-crazy California be as inspired as their Australian counterparts to invest in local transit and to make room for transit-oriented development near HSR and especially, HSR feeder stations? UPDATE by Robert: It's worth noting, in advance of the likely "omg Californians will NEVER leave their cars for trains" comments, that such planning and TOD work is already taking place here in the state. The notion of California as a place without alternatives to the car is at least 30 years out of date. Potential HSR stations in downtown San Francisco (whether Transbay or 4th and King), San José, and Los Angeles already are served by significant amounts of local transit (LA Union Station is the hub of the heavily used Metro Rail system as well as the nation's busiest bus system). TOD is also commonplace near those stations. As Rafael quite rightly points out, of course, there's more that can and should be done. SB 375, the 2008 law which provides clear mandates to planners to include carbon emissions in their studies and gives CEQA exemptions to many TOD projects, will play a significant role in promoting TOD alongside AB 32. Of course, local activism will be necessary to see this through. Siemens’s new train — the Sapsan, Russian for peregrine falcon — is a candidate for the high-speed link planned between San Francisco and Los Angeles that may open in 2020. Alstom, the maker of the French TGV trains, and Bombardier are also contenders. Japanese bullet train designs by Hitachi, which are lighter but less secure in a low-speed crash, the only type of collisions survivable, are another option. The technological breakthrough of the Sapsan is that the train has no locomotive. Instead, electric motors are attached to wheels all along the train cars, as on some subway trains. (Passengers sit in the first car too.) Its top operating speed is 217 miles an hour, though in tests this model has reached 255 miles an hour, or about half the cruising speed of some jet airplanes. For now, though the Sapsan will only be traveling at about 150mph over Russia's dilapidated rails. To position itself to compete in the United States, Siemens has placed employees from its high-speed train division at its Sacramento factory, which produces city trams. California desperately needs jobs like those that would be created building high speed trainsets in Sacramento. Opponents of HSR argue that the risk of a "boondoggle" is greater than the value of the jobs that would be created - 160,000 for the construction of the project, and 450,000 ongoing jobs, according to CHSRA estimates. I have a very difficult time believing that to be the case, especially when California faces the highest unemployment since the end of World War II. But back to Russia (for a moment). Jaunted, a "pop culture travel blog," wondered if this was a case of "the space race race moving to the rails." It would be nice if we could move past Cold War metaphors when comparing the US to Russia, but clearly the space race was an iconic era in the 20th century, where international rivalry produced major human accomplishments that might not otherwise have gotten done. And as much as I support space exploration, it is undeniable that HSR provides more immediate and tangible benefits than putting a man on the moon. What really matters is that nations like Russia, Poland and others are recognizing that having a high speed rail network is essential to their future economic prosperity. The US is not immune, despite what those who refuse to admit that the transportation models of the 20th century no longer work would have us believe. I don't have any plans to be in Russia anytime soon, but if I did, I'd take time to ride the Sapsan. Although most Americans who know anything about high speed rail associate the trains primarily with France and Japan, it is Spain that has had some of the most dramatic success with high speed rail this decade. The AVE (Alta Velocidad Española) trains have attracted significant numbers of riders in a nation whose geography and population densities are quite similar to California, and operating profits from the existing lines have been plowed back into expansions of the system. Someone could think that we, the political representatives in charge of looking after the public interests by assessing the opportunity costs of each choice, would be tempted to follow the easy path on those crucial crossroads. But this is not the case. Maybe Spain, with the socialist party at the head of successive governments, is the best example of how a mindful combination of courageous decisions on difficult times, the power of a cabinet lead by egalitarian principles and the supportive effort of the taxpayers, can lead a country to new heights of economical and social progress. Our high speed rail network reaches now several edges of the Iberian Peninsula, and connects some of the most important cities of Spain with the most sustainable transport mode and in a fast, safe and clean way: Barcelona, Madrid, Malaga, Seville and Valencia at the end of 2010. Its next objectives will be Galicia, the north coast, Portugal and France. The effort under way is so big that, by 2012, Spain’s HS network will be the longest one in service in Europe. And only eight years later, by 2020, another historic landmark will be achieved when more than 90% of the country’s total population will have a HS train station at less than 31 miles away. Sure, López is selling the PSOE as a good steward of a tough economy, but he raises the key points in how we consider high speed rail. HSR opponents have not offered any explanation of how they will grow the economy and provide economic recovery to the people of California. Whereas we who support HSR have history on our side. We built the Golden Gate and SF-Oakland Bay bridges during the Depression. We built Boulder and Shasta Dams. We built the Central Valley Project and countless other key pieces of infrastructure during the worst economic downturn in history. That spending, far from hurting the economy or making the Depression worse, provided job growth in the short-term and provides jobs and savings to this very day. Spanish conservatives even raised doubts and sowed distrust about a high speed system which finally yielded priceless benefits to the whole society. ’Boondoggle‘, ’Loss-making whim‘, ‘Monument to bad territorial planning’… Shielded behind overly simple, short sighted cost-benefit analysis, critics complained with those arguments against high speed projects over years, until the success of each one of the new corridors proved them wrong and showed that in troubled economic times, the best investments for a society are the ones which improve equality. Today, like we did over the last 20 years, we have to express our conviction in a brilliant future for high speed rail in Spain, with the extension of the network to each edge of the country, building a multi-node web in which each city is a centre. A network which draws territories together and grants equal opportunities to each citizen, no matter where he lives. A network which ties us strongly to Europe. Now more than ever, we have to look towards the future and we shouldn’t slow down our pace, because each new high speed line carried out will be at the same time a retaining wall against the economic crisis and a lever to get the society ready for the incoming recovery. High-speed rail can be justified as green if we sort out non-fossil fuel electric power, but the case is really as much social and economic. The unspoken aim of British politics is to make all of Britain middle class, and the middle classes travel – and will do so more and more. It's best if they go by train. Faster journeys are a bonus; the gains are as much about reliability and capacity – good links between Birmingham, Manchester and Leeds, as well as to London. Transport routes north from the capital are full, or soon will be. England's great cities cannot enrich themselves in isolation and the harder it is to get between them, the poorer they will be. Rail investment is a progressive cause, if we don't want to see London as a sort of Singapore, a first world island isolated from – and perhaps one day refusing to fund – an impoverished hinterland. We can say the same for California. High speed rail is essential to providing economic growth and prosperity to California in the 21st century. Driving and flying aren't going to be affordable for much longer, as the great gas price spike of 2008 showed. Since most jobs are going to be created in the urban centers, those who don't have the ability to live there, and other regions of the state, will be locked out of prosperity. Those who oppose HSR are those who believe that the economic system of the latter half of the 20th century will persist forever, with a transportation system that hasn't evolved past 1985. They offer no arguments for how we will solve the gridlock on the freeways and the airports that would come with population growth, except presumably to spend twice as much money expanding those instead of building HSR. They offer no arguments for how we will wean California off of carbon emissions, to which transportation is a key contributor. They offer no real arguments at all about how California will generate jobs and economic opportunity - they just assume it will materialize out of thin air. For the rest of us who have to live in the real world, we cannot put blind faith into a magical economic recovery based on a 20th century model whose failure has produced the present crisis. There is no reason for us to sit on our hands and refuse to follow the proven, successful model laid out by nations such as France and Spain, which have used high speed trains to provide sustainable economic growth and to try and battle a global recession. And of course, Californians have already decided to reject the "lower your horizons and suffer" model being offered by HSR deniers. Californians knew what they were doing when they voted to build a high speed rail system in their state, and knew what they were doing when they voted to put Barack Obama in the White House, a president who understands the value of HSR and plans to fund it. Still, we need to constantly remind ourselves and our fellow Californians of why we did that in November 2008, especially as the HSR deniers and those who would put small, parochial concerns over the needs of the state as a whole try and block HSR from getting built. The LA Times has published an article on Metrolink's safety record, charting the 244 grade crossings deaths on its far-flung network over the past 15 years. On average, that works out to more than one a month. While it is true that Metrolink has suffered safety lapses, most notoriously the case of a train engineer who was texting on a cell phone when he should have been paying attention to trackside signals at Chatsworth, it is also true that the agency has to operate on a shoestring budget. The article complains bitterly about a corporate culture that supposedly prioritizes ridership growth over grade crossing safety, comparing it to MTA. That agency is far better funded precisely because it has higher ridership. Metrolink is caught in a Catch-22. The article also cites the example of a confused elderly lady driver who made a right turn at the Buena Vista Street intersection in Burbank. When the crossing gate came down on her car, she panicked and stepped on the accelerator. Tragically, she was killed in the ensuing train crash. Metrolink concluded it was a clear case of driver error and have made only minimal changes to the intersection in response to the fatality. Without additional public funding, there's not a whole lot it can do. Up in the SF peninsula, Caltrain has a program for rail safety enforcement, but this public outreach effort hasn't made a significant dent in the grim statistics. It seems that in addition to suicidal persons, there will always be a small contingent of motorists who either don't know how to behave at railroad grade crossings or flout the rules. What both commuter rail services have run up against is that the only proven way to eliminate or at least massively reduce grade crossing fatalities is full grade separation plus sturdy fences for the rail corridor. Caltrans did promise to grade separate the aforementioned Buena Vista Street in Burbank against the single rail track in the context of a project to widen I-5, but that's just one one grade crossing among hundreds. Elsewhere in Southern California, a large number of grade crossings were eliminated or had their rail traffic sharply reduced by the Alameda Corridor project. More are either planned or under construction in the context of the Alameda Corridor East project in the San Gabriel Valley. For its part, OCTA is lobbying Congress to close a funding gap for 19 new grade separations on the BNSF Transcon line in Orange County, a critical artery for getting goods in and out of the LA and Long Beach harbors. One of the reasons the California HSR project is so expensive is that it will feature all-new fully grade separated tracks. In the SF peninsula, part of the Central Valley and in the Lancaster-Anaheim section of the Metrolink service network, the starter line will run immediately next to existing regional and commuter as well as freight trains. 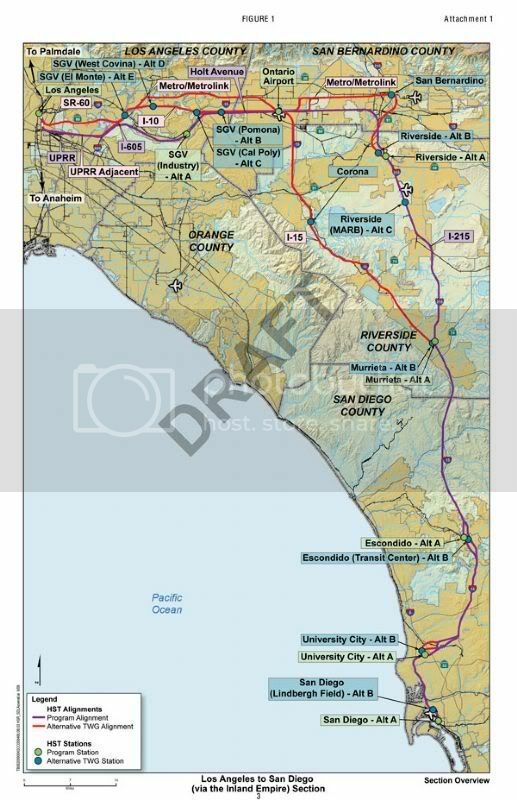 While AB3034, the bill made law by the passage of prop 1A(2008) last November, does not explicitly require CHSRA to grade separate any but the HSR tracks, also including adjacent tracks for legacy services should be a high priority wherever that is technically and economically feasible and, it is not already done or planned in another context. Voters/taxpayers should demand nothing less, even if it doing so entails exercising strictly limited and generous eminent domain against a relatively small numbers of businesses and home owners. This applies in Fullerton just as much as it does in the SF peninsula, Fresno, Bakersfield and elsewhere in the state. The benefits extend well beyond safety, e.g. to rail corridor capacity, reduced dependence on oil in the transportation sector plus the elimination of train horns and warning bells. Taiwan HSR: Harbinger of Doom or Flawed Comparison? We haven't yet seen this story appear as a talking point that widely in California or even among our HSR deniers in the comments, but we will soon. The Taiwanese government is going to have to bail out the private operator of the Taiwan HSR project. They have missed ridership projections and as a result the private consortium that designed, built, and is operating the system cannot meet its debt obligations. Already our old friend Wendell Cox is is using the Taiwan HSR bailout to claim that California HSR will suffer the same fate. Cox, whose work is partly funded by bus and highway companies, is going to continue pushing this simplistic argument until the news media picks it up, which should happen any day now. The problem is that the comparison is almost totally flawed and without merit. What happened to Taiwan HSR is unlikely to happen here. The true lesson of Taiwan HSR is that HSR runs into financial problems when you ask the private sector to fund most of its construction and operations, and therefore leave you unable to weather the 5-year long ramp-up period in ridership. The Taiwanese system, which cost more than $15 billion, was the first in the world built entirely with private funds — 80% of which were secured through bank loans at high interest rates. Though the line’s fare revenues, lower than projected, make up for operations, maintenance, and even most interest payments on the initial capital costs, elevated depreciation charges put the railroad into its misery. The recession, which decreased interest in travel, put the final stake in the company’s heart. This financing system left Taiwan HSR facing massive up-front loan repayment costs. And that in turn left them stuck when the recession hit. To those who would say that if HSR needs a bailout to weather economic downturns then it's not worth doing, I would ask their opinion on the $15 billion airline bailout the US Congress enacted in the wake of September 11 and the 2001 recession. The two experiences cited above indicate that a fully private project is very risky, and that makes sense; making up a huge initial capital cost like that of a rail line through loan back payments requires enormous revenues and limited operating needs. California’s estimates demonstrate annual fare revenues ($2.3-2.5 billion) that are about double operations costs ($1.1-1.3 billion); Taiwan’s system has similar financials, but paying back the bank has bankrupted the company. Is a 20% private share acceptable? A $7 billion private investment would require roughly $560 million a year in payments at 5% interest over a short 20 year-period (totaling about $4.2 billion in interest). California’s system would provide a generous profit of $500 million for the operating company if revenues and operating costs are as expected; in bad years, or if ridership estimates are too high, the system could sustain revenues 20% lower than projected without going into the red. This seems reasonable. California’s interest in a limited private involvement, then, avoids the risk inherent in a fully private project like that in Taiwan. In other words, because California is looking at only a 20% private investment share, we will avoid the crippling problems Taiwan HSR has experienced. This is especially important when we recall DoDo's Puente AVE article, which is required reading on the topic of HSR ridership and financing. For the THSR, cost overruns were largely the consequence of a switch to Japanese suppliers after planning based on European high-speed technology was already well-advanced. The decision was widely rumoured to have been political (and led to an epic political, media and court battle ending in damage payments to Eurotrain), and the overseeing company THSRC did not go with the actual Japanese offer, but stuck to its guns on specifications. Thus f.e. a German maker had to be contracted to supply fixed-track high-speed switches (no need for those on Shinkansen lines with their strictly single-direction tracks). Likewise, both lines were opened half-finished: one-third of the Seoul-Busan KTX line was delayed (until 2011, now thanks to those sleepers maybe even further), THSRC started with a reduced schedule, both started with some stations unfinished (for the THSR, including both downtown terminuses!) or without urban transit connections. Also, both lines started with hefty ticket prices that had to be reduced later. The failure to meet expectations after the start was widely discussed as a national scandal in both countries. However, you can also see on the graphs that there was steady growth thereafter. And that at the expense of other modes of transport. The modal shift was particularly spectacular in Taiwan. In just 20 months, all but one single daily flight between the cities served by THSRC was eliminated (last December, THSRC's share of the air/rail market was 99.95%...), leaving the highway as only competition. Total domestic air passenger transport fell almost by half(!). The steady uninterrupted annual growth of highway traffic was not only stopped but turned back. In short, Taiwan HSR is a successful project in terms of ridership and achieving many of its goals of shifting transportation modes. The problem with Taiwan HSR is largely with the method used to finance it - heavy private sector borrowing. The 80% private funding method left Taiwan HSR financially vulnerable to poor construction decisions, cost overruns, and the global recession. California not only can avoid all this - we are in a very good position to avoid it. As Bob Doty repeatedly emphasizes, the way you deliver an on-time and on-budget project is by getting all the planning and engineering details agreed to at the outset, and then rigorously sticking to that plan, resisting pressure to meddle and change the details midway through construction. Freemark ended his article lamenting the political push for private involvement in infrastructure projects. That has been a particular hobby horse of mine ever since I started this blog. With regard to California HSR, the push for private involvement comes from Governor Arnold Schwarzenegger, who along with his investment banker advisor (and CHSRA board member) David Crane are deeply enamored with public-private partnerships. They put the CHSRA on a starvation budget in 2007 in order to break resistance to greater private involvement in funding the train's operations. And it stems from their desire to use government to enrich the wealthy at the expense of everyone else. California is going to elect a new governor next year. We will need to pay close attention to how the candidates talk about HSR, public-private partnerships, and what their plans are for HSR. The next governor could serve until 2018 if elected to two terms, making it particularly important for us to get that choice right. Of particular interest to readers of this blog are the route options that CHSRA is now looking at (cp. our earlier post LA - San Diego: Quo Vadis). In the draft map shown below, the original route is shown in purple. However, since UPRR doesn't look like it will sell any of its rights of way or air rights above them the San Gabriel Valley, the technical working group (TWG) for the segment headed up by consulting firm SVG has had to look into alternatives. Note that the purple line now includes a section along I-605 and and aerial above Holt Ave, a city street in Pomona. The TWG has also been looking at several alternative routes. A promising candidate would use hwy 60, hwy 57, I-10 and head south on I-15 via the city of Corona, well west of Riverside UC. In that scenario, the HSR station would apparently end up well south of the hwy 91 interchange and not be intermodal with established Metrolink services. Except for a short section south-west of Pomona where highways 60 and 57 codeshare, these highway medians are still available. A second alternative would eliminate Metrolink's San Bernadino line to free up a right of way to reach an HSR station there. That city has always lobbied for one, but the sharp curves in the transition up from Ontario Airport would be problematic. The continuation down to Riverside also looks challenging. Note that leveraging SBD isn't even being considered, LAWA has clearly insisted on a station for ONT to relieve LAX, after deciding to shelve plans for PMD. With a good HSR connection, Ontario Airport might also provide limited relief to Lindbergh Field (SAN). Further south, there is the issue of the I-15 managed lanes project between Escondido and Miramar (already under construction, VIDEO), which is eliminating the wide freeway median CHSRA had hoped to use. However, SANDAG's Linda Culp has been in the loop on HSR planning since 1999. It's not immediately clear if HSR tracks are now supposed to run next to I-15 in this stretch or, on an aerial made possible by extra-tall on/off ramps to the managed lanes. Note also that I-10 and hwy 57 were originally penciled in for the Las Vegas to Anaheim maglev, but that increasingly looks like it will never be more than a paper tiger. Like it or not, California decided in favor of steel wheels HSR last November. Nevada would be wise to set aside its petty internal squabbles and push for electrified DesertXPress at 220mph plus a connector between the towns of Mojave and Barstow. In San Diego county, there are apparently a few route details left to be sorted out near Escondido and past/through Miramar, in addition to exact station sites. In particular, the Lindbergh Field vs. Santa Fe Depot downtown question is still unresolved, as is the location of a yard for overnight stabling and minor maintenance. Keep in mind that there has been and continues to be a great deal of negotiation regarding the route and station placements in the LA to San Diego spur. The situation is still very fluid and the map shown above could already be slightly out of date in some respects. The LA-San Diego spur was included in the statewide program EIS/EIR, but CHSRA has always sought to position it as phase 2 of the entire project. Even so, the fact that this the route and station options are still under discussion underscores that the program-level planning effort did not include actual right of way acquisition. over the past six months, San Francisco's Transbay Terminal Center (TTC) project has been the topic of numerous posts on both this blog and the Caltrain-HSR compatibility blog (index at the end of this post). So why am I revisiting this wretched topic yet again? Well, as Henry Kissinger once famously paraphrased Sayre's Law: "The reason academic politics are so bitter is that so little is at stake." Right now, there's a $400 million grant application from the Transbay Joint Powers Authority (TJPA) to the Federal Railroad Authority (FRA) at stake and, CHSRA is about to ask for $1.28 billion of its own just for the SF-San Jose segment. In addition, the state of California plus several Bay Area counties plus the city of SF are positioned to commit substantial funds of their own on behalf of taxpayers. This dispute is no longer academic, so somehow TJPA and CHSRA need to come up with a face-saving compromise. However, that's no reason to lock in every poor single poor decision each authority has made in this context to date. My objective is to summarize the problems and, to suggest a variation that may be palatable to all sides (see map at end of post). I doubt this post will actually make a blind bit of difference either way in FRA's decisions on the respective grant applications. However, having stirred the pot vigorously, including off-line contacts with TJPA by way of a member of its Citizens' Advisory Council (CAC), I'd like to at least make sure I didn't leave this last stone unturned. So please, indulge me. The site selected to achieve this is the city-owned Transbay Terminal located roughly at Minna, 1st, Fremont and Natoma Streets. Completed in 1939, the structure was initially served by trolleys running on the lower deck of the Bay Bridge, hence the generous grade-separated access ramps now used by buses. The building isn't worth renovating as it doesn't meet modern seismic code but the ramps do. To its credit, the city of SF set out to redevelop the entire area with transit access in mind to avoid increasing congestion on both the bridge and city streets. Land near the terminal that is currently used for at-grade parking lots is to be converted to multi-story buildings, a combination of office towers and affordable apartments. (e) result in the lowest feasible combined costs for construction of the bus terminal and the Caltrain station, without sacrificing the aesthetic qualities of the terminal and station and their interface with surrounding development. The legal basis for the TTC project therefore requires construction of both a downtown train station for Caltrain and a transbay bus terminal for the benefit of city residents and commuters. The DTX tunnel and train station are neither optional nor were they an afterthought. Note the requirement for the "most convenient" and ADA-compliant pedestrian connectivity between Caltrain and BART/SF Muni subway in the downtown area. Prop H also mandates Caltrain electrification prior to start of operations and a tunnel that is bored rather than excavated from above via cut-and-cover. The tunnel and railway station infrastructure were subsequently mapped to a second phase of the project because at San Jose's insistence, Santa Clara county refused to commit its share of the electrification funding in light of the sky-high cost of extending BART to Santa Clara. Section 3 explicitly rules out partial electrification, so SF could not proceed until CHSRA offered to come to the rescue. Shoot foot, reload. TJPA interpreted point 2(c) to mean that the downtown train station would have to be physically underneath the bus terminal to maximize foot traffic and hence, lease revenue from a co-located shopping mall that is supposed to help pay for the project. Amazingly, it also believes this configuration will result in the lowest total construction cost (cp. point 2(e)), even though every tunnel curve excavated under existing buildings is extremely expensive. Shoot other foot. The option of constructing tracks under nearby Beale Street to create a station that would be intermodal with both the bus terminal and with Embarcadero BART at Market Street was rejected for the following reasons: tunneling risk near the Bay Bridge anchorage, limited width that would require a multi-story station and, potential problems with box sewers under Embarcadero and Mission plus the foundations of older buildings between Market and Mission. There is also a desire to reserve Mission Street for a second BART line served by a second transbay tube, a very expensive project that may one day become indispensable. An underground station under Main Street (best viewed in satellite mode, zoom in for details of track layout) and land just west of it would permit up to 11 staggered tracks in a single level, seven of them full length (1320'). Afaik, this was never studied, perhaps because it wouldn't generate enough foot traffic for the aforementioned retail outlets. It's all about the shopping, getting from A to B be damned. The upshot of all this is that the design now features a "train box" with just six platform tracks parallel to Mission Street. The western end of all six lies roughly at the western end of the existing terminal building. In an effort to minimize tunneling cost, TJPA selected an approach via Townsend and 2nd rather than 3rd - let alone one via 7th and Minna or a station under Mission Street. The result is a sequence of three extremely tight curves in the final approach into the train box. Note that the northern four tracks have since been extended to Main Street at CHSRA's request. The very expensive excavated tail tracks were moved to the southernmost tracks, which are nominally reserved for Caltrain. Harmonizing platform height to the level required for HSR would eliminate hard platform track assignments and hence, the need for tail tracks. While trains can get around tight curves, this is not at all recommended if their axles are rigid. TJPA cites the example of the main station in Cologne (Germany) whose throat features a minimum curve radius of 550 feet. Please turn up the volume and watch the video below to get a sense of what wheel squeal on the top of the rail sounds like in the real world. Nails on a blackboard have nothing on this. In the TTC, the sound will be even more painful to passenger's ears as the acoustically hard surfaces of a tunnel and underground station tend to concentrate sound volume. The associated wear and tear on both wheels and rails also tends to increase rail/wheel noise emissions all down the line and/or maintenance overheads. The curve at Townsend and 2nd is similarly tight and, TJPA's engineers and consultants have talked it into needlessly using only straight switches and constructing not two but three tunnel tracks all the way to 4th & Townsend. This forced the use of slow, labor-intensive sequential excavation over a conventional two-track tunnel boring machine. Separately, Clem Tillier has pointed out problems with the configuration of support columns, including those on the platform tracks which may impede pedestrian flow to and from the island platforms. He has also lamented the lack of architectural grandeur below the surface, imposed by the inclusion of a full concourse level. He cites the interior of Berlin's Central Station as an example of what billions of dollars can buy you. Note that TJPA claims the orientation of the train box retains the option of one day running trains to the East Bay via a transbay link for standard gauge services. This is not rquired by prop H(1999) and a bit of a crock, at least for HSR, if only because tunneling under the tall buildings between Main and Embarcadero would be prohibitively expensive. More to the point, there is zero room for dedicated HSR tracks between Oakland and Benicia. For the moment at least, there's insufficient demand for single-seat standard-speed service between SF and Sacramento to justify the construction of a fixed link for standard gauge tracks. For the price of just that, you could finance a ton of improvements to Amtrak CC, including bypass tracks and tilt trains for express service between Emeryville and Sacramento. One reason there is now such tension between TJPA and CHSRA is that that latter agency was hamstrung by a four-year delay in getting prop 1A(2008) onto the ballot, compounded by a year spent on a starvation budget imposed by Gov. Schwarzenegger who was dissatisfied with the lack of private investors in the funding plan. Since he who pays the piper calls the tune, this massively weakened CHSRA's leverage in negotiations with TJPA while it was making decisions on the underground portions of the project. In particular, CHSRA failed to insist on an underground pedestrian tunnel all the way to a BART/SF Muni subway/streetcar station, even though HSR ridership will depend heavily on excellent connection to these existing high-capacity rail services and prop H(1999) actually requires something along these lines. Forcing many thousands of passengers to hoof it across busy city streets every day is not an acceptable outcome for a multi-billion dollar project. For order-of-magnitude reference, BART delivers about 60,000 transbay passenger trips on a normal weekday Labor Day weekend Monday (more on regular weekdays, h/t commenter mike), AC Transit buses just 12,000. GG Transit buses come in at around 9,000 and GG Ferries at a surprisingly high 6,000. SF Muni metro and the F streetcar line deliver 170,000 trips per day, about half the number of all of BART. The capital costs needed for the HST component of the Transbay Transit Center (including the 1.3-mile extension) is estimated to be similar to the estimated costs for the 4th and King option. Since the rail component would be shared with Caltrain services, the Transbay Joint Powers Authority funding plan assigns only a portion of the rail related Transbay Transit costs to the HST system. As if an HSR station at 4th & King wouldn't be shared with Caltrain! Given that facility is at grade and has 12 platform tracks, CHSRA evidently believed at the time that the HSR project's share of the cost of the anyhow-planned DTX tunnel and train box would be quite small, but it failed to get that in writing from TJPA. Now, the forecast for the underground portion is on the order of $2.8 billion and TJPA wants the HSR project to fund the lion's share of that on top of Caltrain electrification. Section 2704.04(2) of AB3034 turned CHSRA's preference for the TTC into a hard mandate. Shoot foot, reload. CHSRA is also locked into the idea that San Francisco is the end point of a train trip from Southern California. It insists on dwell times of 30-40 minutes in the TTC, even though AB3034 mandates feasible headways of no more than 5 minutes for the entire HSR network. With just four platform tracks at the TTC, dwell times above 20 minutes - including the time needed to traverse the throat twice - are out of compliance. Unfortunately, instead of trying to bring down dwell times, CHSRA is now looking for ways to secure more platform tracks in SF. AB3034 limits the network to 24 stations and 4th & King is too far from downtown for anyone to argue with a straight face that it could somehow be considered part of a modified TTC design. A relatively cheap tunnel + station with four straight full-length platform tracks, intermodal with Civic Center BART/SF Muni, with an option for four more under 8th (h/t to commenter Andrew), is now also out of the question for HSR. Worse, since TJPA already has a Record of Decision on its design, any major changes at all would jeopardize its grant application against the $8 billion HSR portion of ARRA and invite the wrath of an entire city. Shoot other foot. Ergo, CHSRA should get cracking on reducing dwell times to below 20 minutes so it can make do with four full-length platforms. One way to achieve that is to redefine the route of any given train as SoCal to SF and back again. This would preclude cleaning and light housekeeping of the seating areas in SF, but then Amtrak doesn't do that nor reprovision the cafe cars every 400 miles, either. The restrooms could be cleaned one-by-one en route in the SJ-SF-SJ segment. Cleaning staff could use Caltrain to commute if required. A little lateral thinking by CHSRA would go a very long way here. For better or worse, the political reality is that CHSRA's chances of getting TJPA to abandon its train box under the bus terminal are now slim to none. In part, that's a result of Gov. Schwarzenegger's actions but there's plenty of blame to go around. Accept that at least some HSR trains are going to have to use the TTC train box, warts and all. In the early years of operations, make that 100% of HSR trains. Change operations concept to reduce dwell times in SF to below 20 minutes and ensure compliance with the 5 minute headway requirement in AB3034. Get the city of SF to commit to a second, separate EIS/EIR for constructing a dedicated underground pedestrian passage between Embarcadero BART/SF Muni and the HSR tracks under Main Beale Street (this was already studied in 2007 but remains unfunded). Design it complete with bright lighting, moving walkways and security staff, to actually implement the spirit of section 2(b) of prop H(1999). In addition to connecting to the concourse level, consider also connecting to the BART island platform from below to address existing pedestrian flow constraints there. Those will only get worse as the financial district expands south of Mission. Start of operations would have to be concurrent with that of the TTC train box. Consider using Talgo equipment, since that is the only manufacturer to offer both double-deck commuter and suitable high-speed trains with very short cars, individual axles for each wheel and passive steering of each wheelset. That means they can negotiate very tight corners with reduced squealing (the tractor cars still have conventional rigid axles). If other trains vendors are chosen, prioritize the development of dry lubricant strategies that are compatible with EMU traction and don't reduce line capacity by increasing emergency braking distances. Apparently, that's a non-trivial problem or Deutsche Bahn would be using such a system in Cologne today. What's available on the market may be suitable for coasting through at speed, but in a station throat braking and acceleration are required. Note that TJPA has no authority to de facto make train vendor decision for Caltrain and/or CHSRA, nor should it. All I'm saying is that as long as the three curves in the approach remain this tight, Caltrain and CHSRA will have no choice but to somehow mitigate the inevitable consequences. If the aural experience of the SF train station is negative, ridership will suffer. Consider harmonizing the platform height of Caltrain locals at HSR levels and assigning platform tracks on real-world demand, eliminating the need for tail tracks. Optionally, extend the southernmost platform tracks (#21+22) as far as Main Street as well. Irrespective of platform height harmonization, consider letting Caltrain run strictly regional HSR trains between SF and SJ as long as there is spare capacity on the HSR tracks in the SF peninsula. Eliminate the 4th & Townsend station from the DTX tunnel. Instead, have tracks descend at 3.5% gradient immediately after crossing Mission Creek through the curve near 7th & Townsend. Use switches to create an underground station with two short platform and two through tracks on 4th & King property. If absolutely necessary, stack additional platform tracks on top of those. Limit tunnel to two tracks between 4th & Townsend to 2nd & Folsom and use a single TBM to excavate that. Deploy crossover switches in the last section, followed by two Y plus one reverse Y switches to branch into three platform connector tracks. Just north of Tehama, use switches and diamonds to implement turnoffs toward the TTC train box. Dead-end the through tracks for now. Negotiate HSR and Caltrain ridership conditions that would require the city of SF to kick off a third phase of the TTC project, subject to a third EIS/EIR process. This would implement an "auxiliary terminal" featuring three additional full-length platform tracks at level -2 under 2nd Street between Market and just south of Howard. This would be intermodal with the existing Montgomery BART/SF Muni at Market plus city and GG transit buses at 2nd/Mission and also permit a future second BART line along Mission at level -3. Note that the available width under 2nd, including sidewalks, is 75 feet. A second pedestrian connector passage, similar to the first but above e.g. Minna Street between 1st and 2nd, would be included in the scope of the EIS/EIR auxiliary terminal. The auxiliary terminal concept would be considered part of the TTC but remain unfunded for the time being. Let's see Caltrain and HSR actually achieve something approaching their rosy ridership forecasts first. NOTE: I've edited the map to move the phase 2 pedestrian passage from Main to Beale Street since TJPA already studied that alignment in April 2007. It has languished for lack of $105 million in funding, something the HSR project can and IMHO should help provide if it ends up using TJPA's TTC train box as designed. Mar 03 Tight Squeeze At Transbay Terminal? “I believe in alternative transportation,” said architect Alex Kosich at the Sept. 16 meeting at the Stallion Springs Community Center. “I rode my bike six miles to this meeting. Kosich said he and his wife Laila, who is French, are accustomed to riding the high-speed trains from Paris to Lyon. The article includes some critical voices, including one guy who voted against the train out of financial concerns. While the rail line in the Tehachapi Pass will follow the BNSF line, there will be no loop similar to the famous Tehachapi Loop at Keene that has been in use since it was built in 1876 and draws railfans from around the world. With better technology, railroads do not need to adhere to the 2.2 percent grade restriction dictated by Abraham Lincoln's Pacific Railway Act of 1864. “We can go steeper, to 3 and one-half percent,” said Roworth, the engineer. In any case, he said after a moment of calculation, at 220 miles an hour, the train would need a circle 16 miles in diameter to make a loop. Of course, whenever the Tehachapi Pass/Palmdale alignment comes up, we get commenters coming out of the woodwork to argue that this alignment is flawed, too costly, a sop to developers, etc. Never mind the fact that 500,000 people live in the area, a number projected to rise to 1 million by 2020 with or without HSR. The key factor in picking the Tehachapi alignment over I-5 is that, as anyone who has actually driven I-5 through the Grapevine knows, the I-5 route is very mountainous, whereas the Tehachapi Pass is much less so. The CHSRA reached that conclusion over 5 years ago when it eliminated the I-5 route as too challenging and costly for the significant amount of tunneling that would be required to serve that route - a route that wouldn't include any new riders. The application also includes funding for preliminary work in all the corridors of the planned HSR route, including the Sacramento and San Diego extensions. The four "design/build" corridors would enable actual construction of trackage to commence, though to varying levels of completion. Only the Caltrain corridor would include full electrification, and there it would also include Positive Train Control (PTC), along with the San Bruno curve and other "high-priority" grade separations. Merced to Fresno and Fresno to Bakersfield would see tracks built, but no electrification or PTC. (Merced to Fresno is to be along the UPRR/CA-99 corridor, which is obviously going to be an issue; Fresno to Bakersfield is via BNSF corridor.) LA to Anaheim would be everything except electrification (including PTC). Given the limited possibilities of the way the stimulus is written, this is a pretty sensible approach. Getting PTC and electrification on the Caltrain corridor is an extremely high priority both for Caltrain's survival and for getting HSR seeded on the Peninsula. The trackwork in the Valley will help enable the test track, and getting LA to Anaheim mostly built means it won't take much to get genuine HSR up and running in an extremely high-profile corridor. On Tuesday the Tulare County Board of Supervisors will vote to intervene in contention centered on a potential high speed rail line in the San Joaquin Valley. The supervisors will take a stand on whether or not a segment of rail should stretch from Bakersfield to Merced, or only to the halfway point in Fresno. Federal money to design and build the rail is now available through the American Recovery and Reinvestment Act of 2009, however some have suggested that only one of the segments should be submitted to the Federal Rail Administration for funding. The California Partnership for the San Joaquin Valley has suggested that valley officials advocate for the entire system, as voters approved a statewide high speed rail system with the passage of Proposition 1A in 2008. A decision on how the far the rail should extend, and to what counties, is expected to be made Sept. 23 at a special meeting held by the San Joaquin Valley Policy Council. As you can see by the staff recommendation, CHSRA is committing itself to funding BOTH segments of the Valley corridor. But that may not be enough for key players in the Valley, who want to ensure that HSR isn't built in pieces. Overall I think this is a sound approach to the federal stimulus, given the limitations of the ARRA law. The only concern I have is that there's nothing for the construction of the mountainous segments through the Pacheco and Tehachapi Passes, but there's probably no way those plans can be "shovel ready" by September 2012, as ARRA requires. Shortly before USDOT is due to decide how to allocate the $9.5 billion Congress has already approved for HSR nationwide in two separate bills, a new America2050 study analyzes and ranks 27,000 city pairs to determine Where HSR Works Best. Its recommendation: priority should be given to upgrading speeds in the NEC, upgrading the Chicago-Minneapolis/St. Louis/Detroit routes and, to building the first "express HSR" route in the country between SF and LA/Anaheim. Note that the study did not factor in cost, it only looked at transportation benefits. The Transport Politic discusses SNCF's 1000-page response to USDOT's RFEI on HSR projects nationwide. The state-owned French railway zeroes in on opportunities for express HSR at up to 220mph in California, Florida, Texas and the Midwest. It refers to these as "HST 220". Note the complete absence of the NEC in SNCF's response and, the subtle differences relative to the phasing map America2050 has produced. CA State Assemblywoman Fiona Ma (D-SF) and Speaker Karen Bass are lobbying for ARRA funds for California. In her meeting with Joel Szabat, Deputy Assistant Secretary at the US Department of Transportation, he hinted that the state might get as much as $4 billion for its HSR starter line. The decision will ultimately be up to his boss, Secr. Ray LaHood. Las Vegas-Anaheim maglev project to get $45 million for environmental studies on the Nevada section after all. Supporters cite lack of commitment to onward connection from Victorville in DesertXPress proposal. USDOT credit council recommends granting a $171 million TIFIA loan to help build the SF Transbay Terminal Center. This will cover 14% of the phase I capital investment. Estimates for total cost including the DTX tunnel and train box are now at $4 billion. HEADS UP: CHSRA is hosting three Alternatives Analysis Open House meetings for SF peninsula. A British construction company, Balfour Beatty, said Thursday that it had agreed to buy the New York transportation engineering group Parsons Brinckerhoff for $626 million. Balfour Beatty said the deal would help it establish a global professional services business with more than 14,000 employees and give it a leading position in public works in the United States as the Obama administration spends billions upgrading the railways, roads and bridges. Balfour Beatty has extensive rail project experience, including being a co-contractor on the Channel Tunnel and London's Docklands Light Railway. It is unclear that this point how the purchase will affect Parsons Brinckerhoff's operations or practices, if at all. 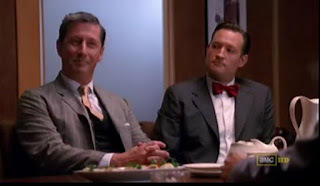 Let's hope this British purchase of a successful American firm turns out better than it did for Sterling Cooper. I have to run and catch a train here in Sacramento, but I wanted to get this up there for everyone on the blog to read and react to. Obviously this means the dispute between CHSRA and TJPA is not going away anytime soon. I continue to believe that political leadership, particularly from San Francisco's powerful federal representatives, is desperately needed to bring CHSRA and TJPA to the table to develop a workable solution. So what’s the beef now? Rather than employ the downtown extension alignment and station location previously adopted by the Transbay Joint Powers Authority, the CHSRA would instead like to override the TJPA’s previous efforts and study alternative locations for the San Francisco terminus in its project-level EIR/EIS for the San Francisco-San Jose segment. In particular, the CHSRA has set its sight on another terminal to accommodate its exaggerated capacity requirements — the Beale Street terminal, situated parallel to Beale Street, and stretching roughly from Mission Street to Harrison Street. But this is an alternative that was resurrected from the dead. In the 1990s, a handful of potential Caltrain downtown extension alignments were considered. Most of those, including alignments leading to a Beale Street terminal, were rejected as undesirable or infeasible. What happened was this: CHSRA obtained a legal opinion from lawyer Duane Morris that claims TJPA is obligated to review the Beale Street alternative under both CEQA and NEPA, under the argument that the existing EIR/EIS was approved on the basis of Caltrain being the primary user of the downtown tunnel extension (DTX). Since HSR's use requirements are different, the opinion goes, a new EIR/EIS is needed that would include the Beale alignment. But it does not seem coincidental that the agency’s temper — presumably largely fueled by, or embodied in, its ever-colorful former chairman, Quentin Kopp — flares up at the exact points in time when the TJPA competes with the CHSRA for access to new pots of funding that are being made available for high-speed rail....California has submitted project requests to the U.S. Department of Transportation, including a $400 million request that, if granted, would allow the Transbay Transit Center’s train box to be excavated sooner rather than later, using a “bottom up” construction approach. Transbay, by virtue of its completed environmental documents, is classified as a “ready-to-go” project, eligible for a Track 1 high-speed rail stimulus grant. In just a few weeks, the Federal Railroad Administration will announce the Track 1 projects that it has selected for grants. It is this issue that has caused tempers to flare over this dispute. The Federal Railroad Administration is going to decide soon on whether Transbay and the train box will get federal HSR stimulus money. TJPA and the Bay Area transit community are concerned - rightly - that CHSRA's actions will jeopardize that money. CHSRA has not offered any official comment on this subject for this post, despite my inquiries. Based on other published reports, including things we have discussed at this blog, we do know that CHSRA has raised concerns about the platform capacity at Transbay. We also know that the relationship between TJPA and CHSRA is very sour. Last December Kopp blasted TJPA's Maria Ayerdi-Kaplan for trying to keep Kopp and CHSRA out of the planning and discussion process. For their part, as Eric noted above, TJPA believes CHSRA has been trying to undermine the Transbay project at almost every turn. Although the CHSRA may believe any problems with the HSR/DTX project lie with TJPA, it should be quite clear to them they have lost this particular battle in the court of public opinion. Bay Area transit advocates are outraged at the prospect of the Transbay trainbox losing out on badly needed federal funding. The use of development rights - specifically, selling the air rights to build skyscrapers to help pay for the Transbay project - is correctly seen as an innovative model for funding urban transit infrastructure. The DTX and train box are considered vital for bringing more mass transit commuters to the SF urban core - particularly for Caltrain. Proposition H passed by a significant margin in 1999 by SF voters to approve the project, and the project remains popular with San Francisco residents. We don't yet know if it is too late, but my strong advice to CHSRA is to make peace with the Transbay Terminal project. If the federal funding is denied, it will do nothing to help CHSRA's relationships around the state and could cause a reaction from SF's influential political leadership. If there were enormous flaws with the design then that would be good reason to oppose the funding and redesign the project, but even those who have criticized the design of the "throat" haven't suggested the project be scrapped or that the "throat" design is unworkable (although it is not an ideal design). I also renew my call for federal intervention. Speaker Nancy Pelosi and Senator Dianne Feinstein are extremely well positioned to play a role as mediator between TJPA and CHSRA. We called for this to occur last December when the CHSRA/TJPA dispute first emerged. It hasn't happened and both the Transbay Terminal and the HSR project are worse off for it. As a structural engineer, longtime Bakersfield resident Ed Creswell is thrilled that America's first bullet trains will fly right through his city's downtown district. "It's a great project," he said. "And I'm excited for our community." But for Ed, his wife Judy and some of their neighbors there's also a downside: The 220-mph electric rail line is being routed right through his Rosedale-area neighborhood on an elevated track 30- to 40-feet off the ground. And that will affect property values and the quality of life in their horse-friendly tract. "A lot of families have been out there 35 to 40 years or more," Creswell said. "They're not really anxious to move." The article doesn't tell us what the Creswells came away from the meeting thinking about the HSR project. Obviously there are residents in Bakersfield who, as in Santa Fe Springs and Palo Alto, to name just a few cities, are wondering how to strike a balance between their desire for HSR and their concerns about how it will impact their communities. I am sure there will be some NIMBYs reading this saying "HA! See, it's not just us folks that are upset about this" - but that would be missing the point of a Bakersfield newspaper's anecdote of ONE homeowner who doesn't seem to be espousing any NIMBY ideas at all. While there will be some noise associated with these rolling bullets, there will be no rattling, no clackety-clack of rail noise -- and the on-board ride will be so smooth, you won't spill your beer while walking back to your seat, Bowen said. All I know is that on the first SF to Anaheim trip circa 2020 - and I fully intend to be on that first train - I'm going to have so much champagne I don't know if I will even be able to stand. Moreover, as California and the state both grapple with a struggling economy, it is important to respond to the areas of greatest need when opportunities for employing our workforce exist. The Central Valley has the highest unemployment rates in the state with areas experiencing a staggering 40 percent of people without jobs. These are not the unwilling or unfit to work, these are former farm workers, mechanics, construction workers and others who have the skills, ability and desire to work. The Depression-era reality for many rural communities of the Central Valley showcases the greatest need for new jobs that will help buttress the state and local economy as well as put people back to work. The Central Valley has experienced hardships unlike anywhere else in the state. Restrictions on water to our farms, a crippled dairy economy and the ripple effect of high unemployment and businesses closing their doors have made the Central Valley the epicenter of this recession. When you pair the logic of starting this project, with the Bakersfield to Merced corridor, and the great need for such a project in these areas, the choice to do so in the Central Valley is a clear win-win. I urge the Federal Rail Authority to award funding to the Bakersfield to Merced corridor as the best option for bringing high-speed rail to fruition in California. I hope that they also see that the intent of this funding is to address the need for good jobs in areas that are struggling to survive. Kudos to Gilmore for understanding what too few of his fellow Republicans grasp: that federal spending is absolutely necessary to deal with this severe recession, and that HSR is as good a project as any to deliver those jobs.